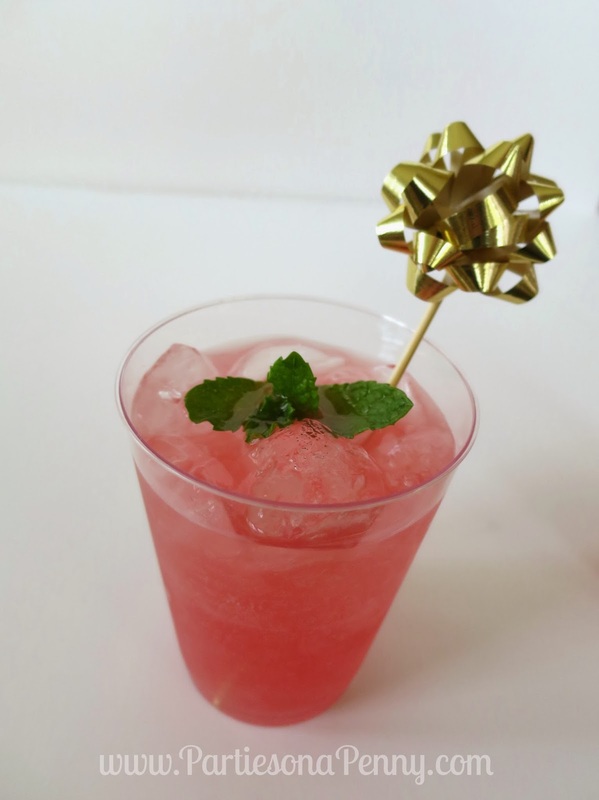 Here is a quick and inexpensive way to add some festive holiday cheer to your cocktail party this Christmas. First, dip the sharp tip end of a skewer in glue. Next, hook on one bell then dab the end of the skewer into the glue again. Finally, hook on a second bell making sure to secure the tip of the skewer inside the bell. Let dry for about 5 minutes. Simply dip the sharp end of each skewer in the glue. 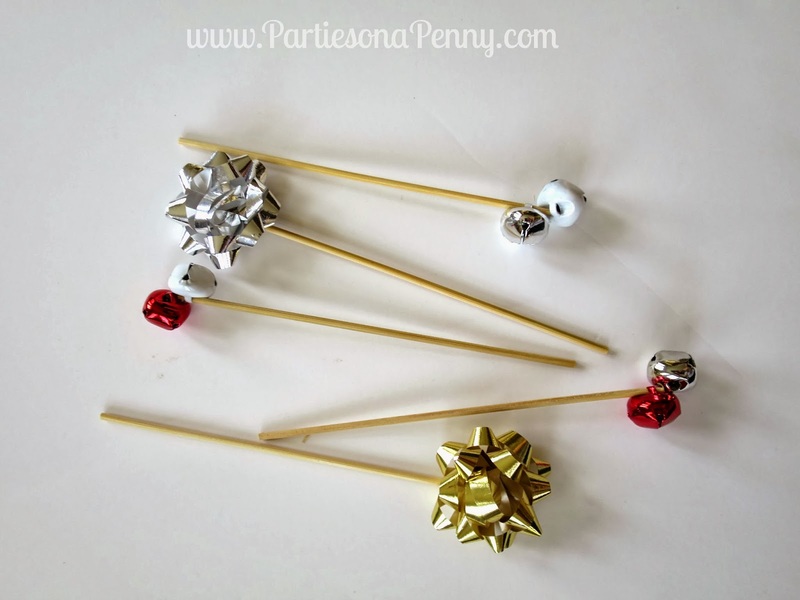 Then secure the skewer under the staple on the back of each bow and you're done! 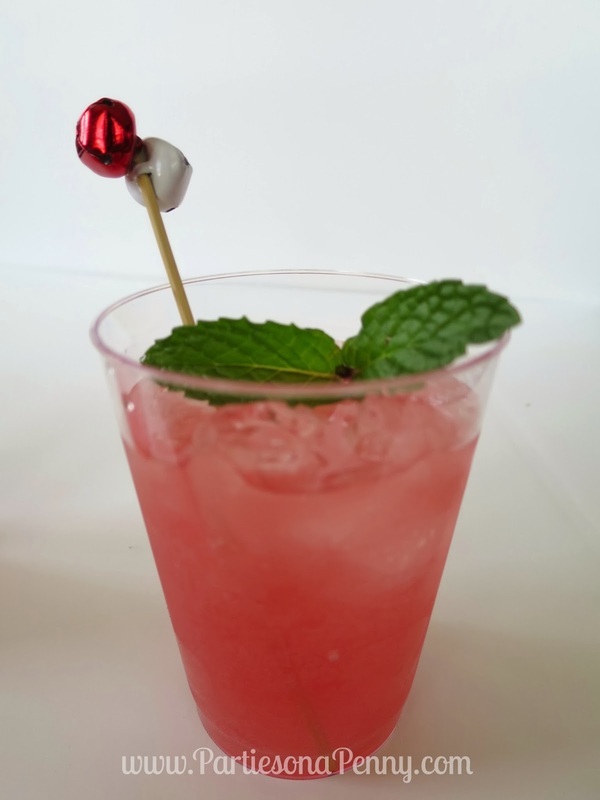 Add these holiday stirrers to a glass of eggnog, cranberry mojito, champagne or any other holiday cocktail. They also can be used to help your guests distinguish which glass is theirs at your party. 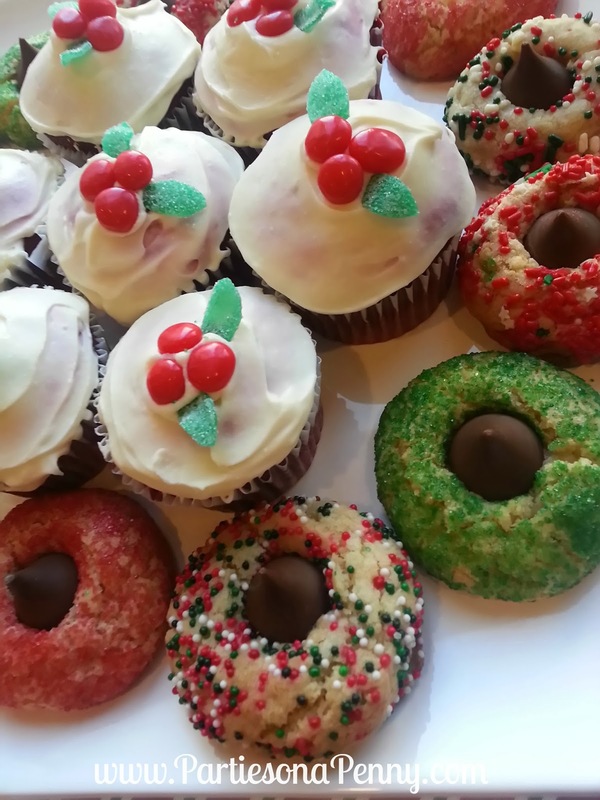 One of the best things about the holidays is the infinite amount of dessert ideas you can come up with as there are so many great colors, flavors and inspirations to get really creative. 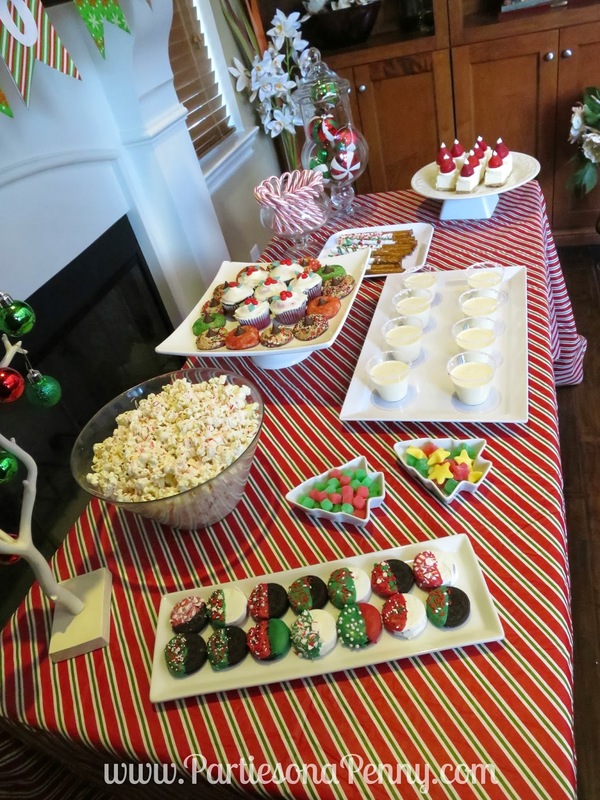 Here is a simple holiday dessert table on a budget, because we all know that during the holidays budgets can be tight. Decoration for the Christmas holly was put together with candy Red Hots and leaves cut out from green sour belts. 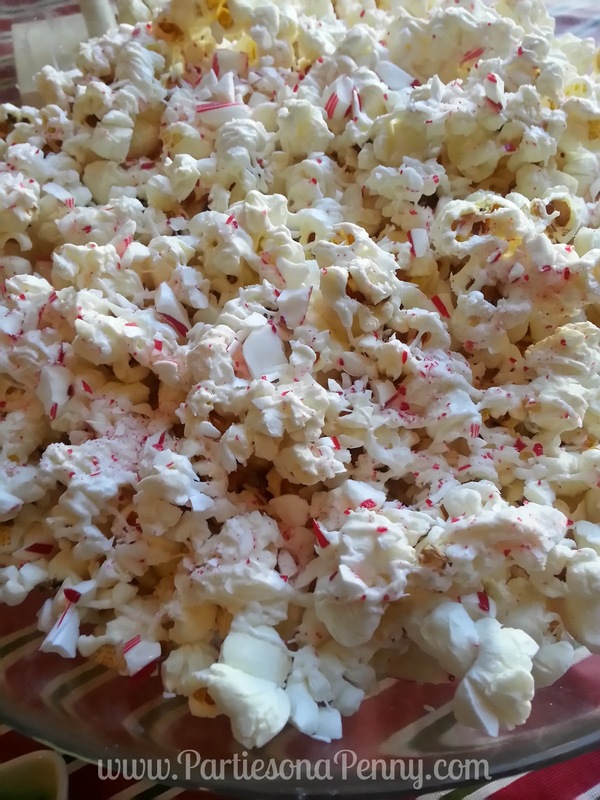 Cooked popcorn (non buttered) mixed with white chocolate candy melts and crushed peppermint. So good, I could eat a whole bowl on my own! Form one inch balls from sugar cookie batter. 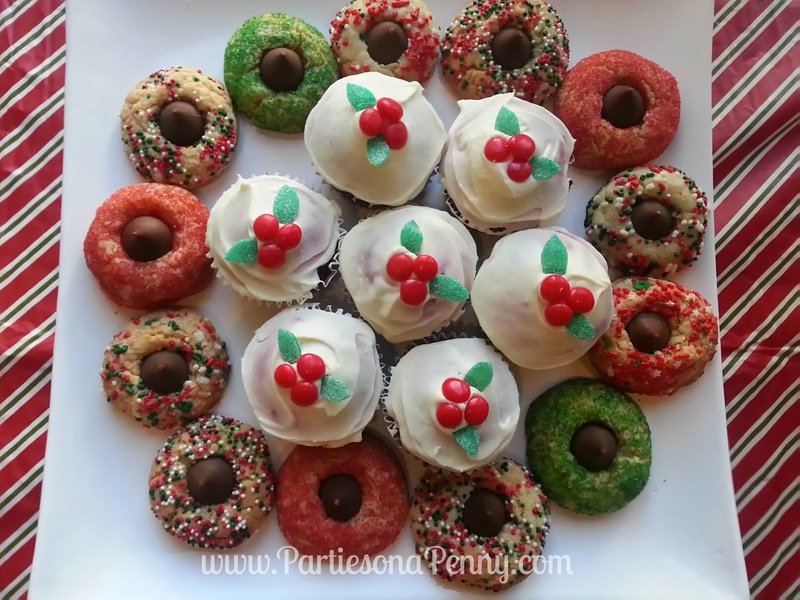 Then, roll each sugar cookie ball in various sprinkles. Bake as instructed and immediately after taking them out of the oven, press a Hersey Kiss in the center of each cookie. Cool at least 5 minutes before serving. 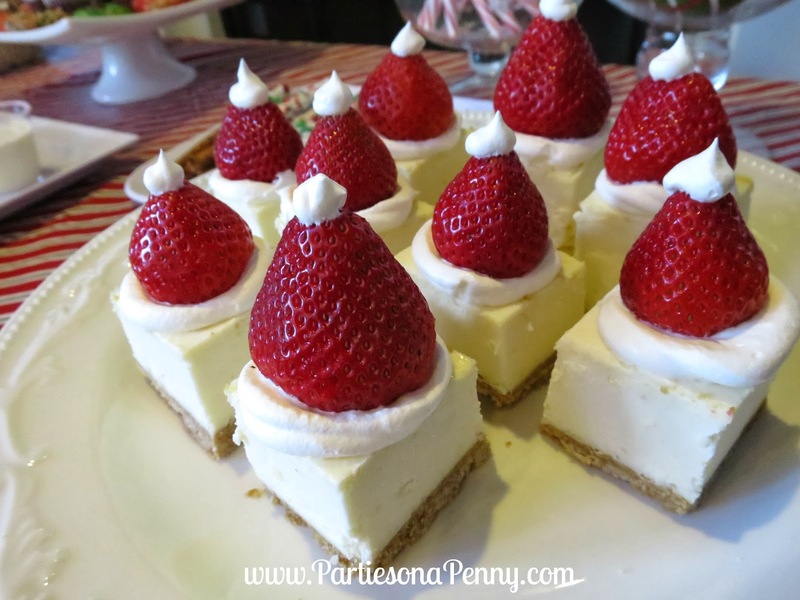 To save time, I purchased a pre-made frozen cheesecake. After thawing the cheesecake for about an hour, cut out 2" squares. Using a Ziplock bag, pipe a dollop of cool whip on top of each square. Next, press a de-stemmed strawberry (tip up) into the dollop of Cool Whip. Finally, top each strawberry tip with Cool Whip. 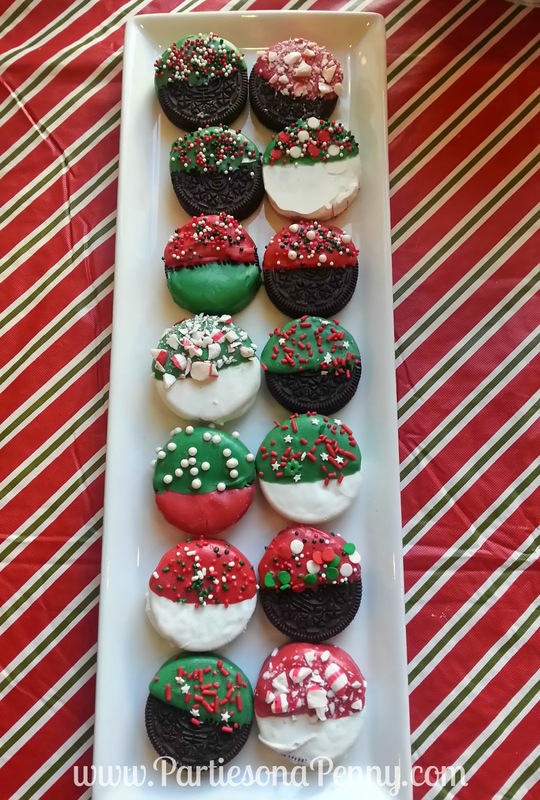 Dip Oreos and pretzel rods (easily found at any grocery store) into melted white, green and/or red colored chocolate candy melts. 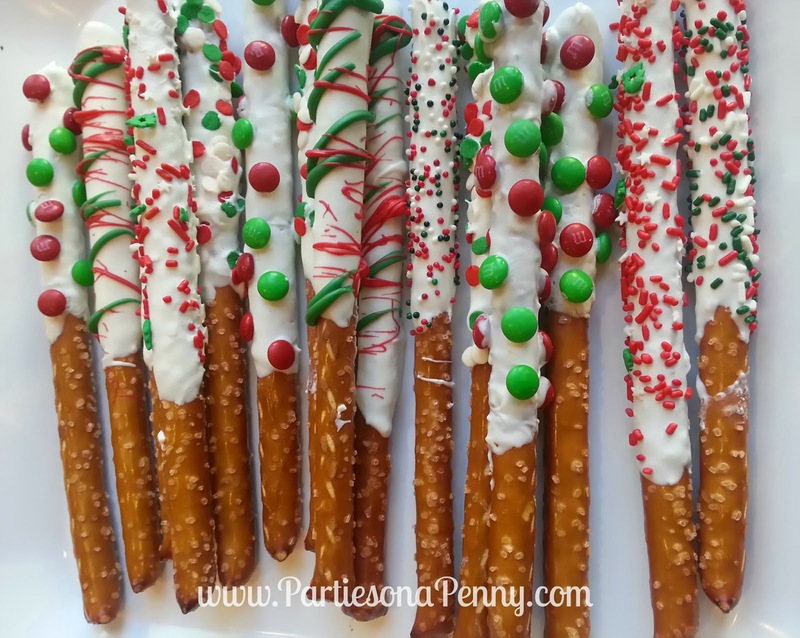 Roll or sprinkle each Oreo or pretzel rod into various holiday sprinkles (Michaels has a great 6 pack holiday sprinkle mix for $3 using a coupon). 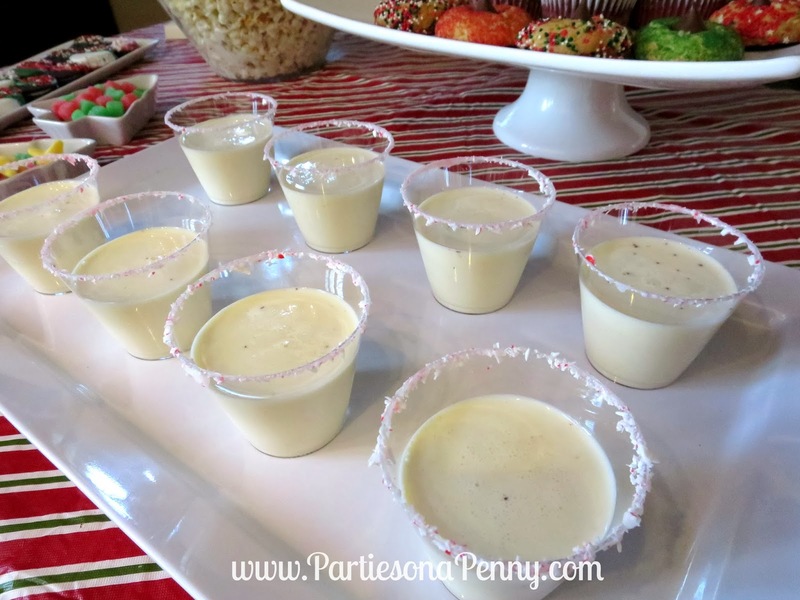 Rim each glass with crushed peppermints before pouring in eggnog. Keep chilled in fridge till serving. 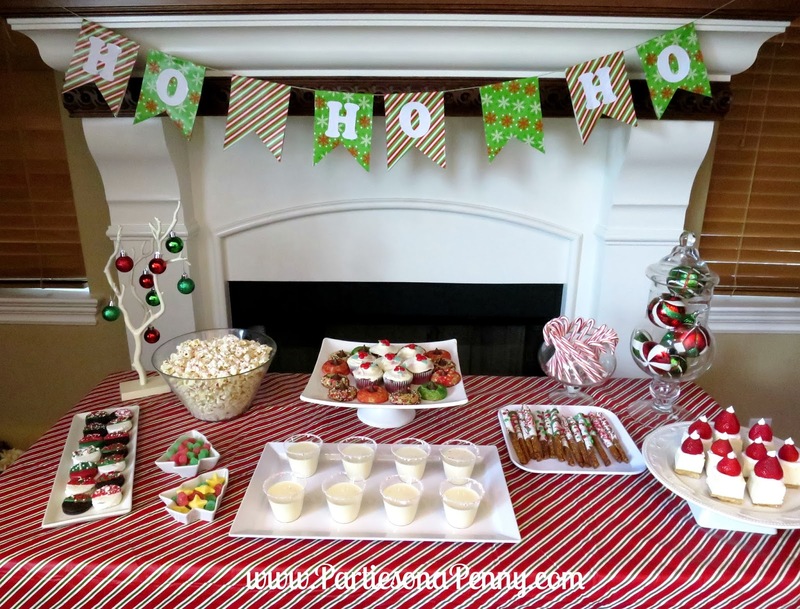 You can find this great holiday striped vinyl tablecloth at Walmart for only $4! Everyone has a roll or two or ten of holiday gift wrapping paper stored somewhere in their home. 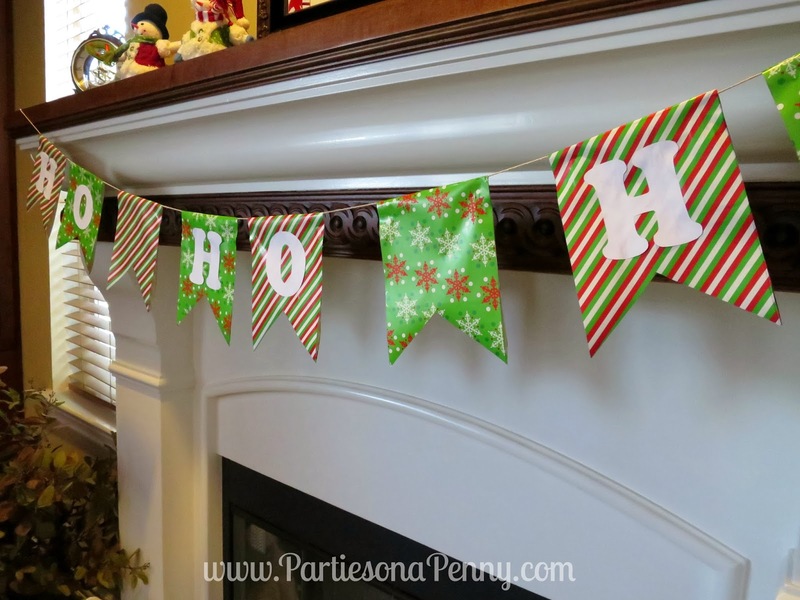 Here a great way to utilize those rolls of holiday gift wrapping paper to decorate your home or party during the holidays without spending a penny! 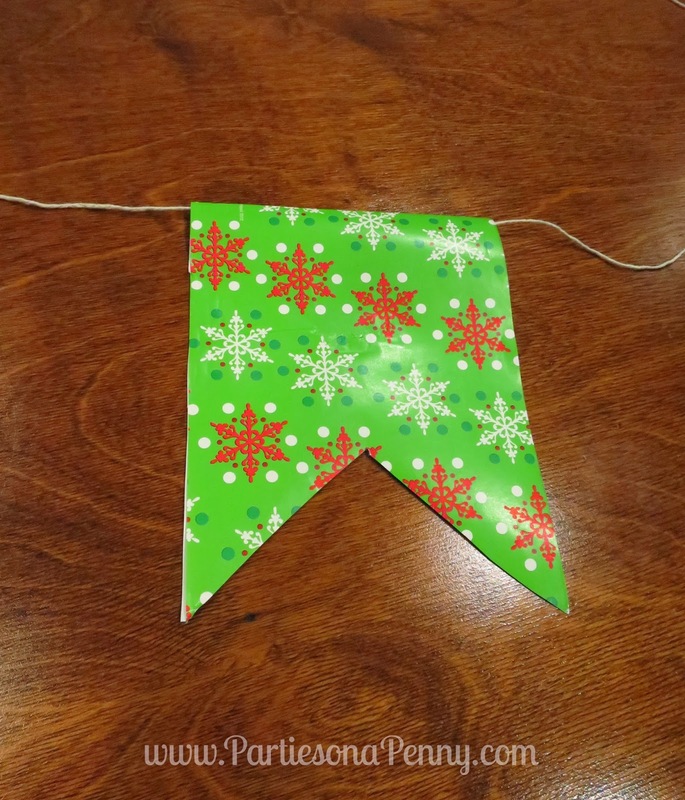 To create this pendant banner, I used about 1/2 yard each of two different patterned wrapping paper. Cut out 4 rectangular pendants (5.5 inches wide and 16 inches long) of each pattern. Using wrapping paper with grid lines helps tremendously! Next, fold each pendant over in half then unfold it. 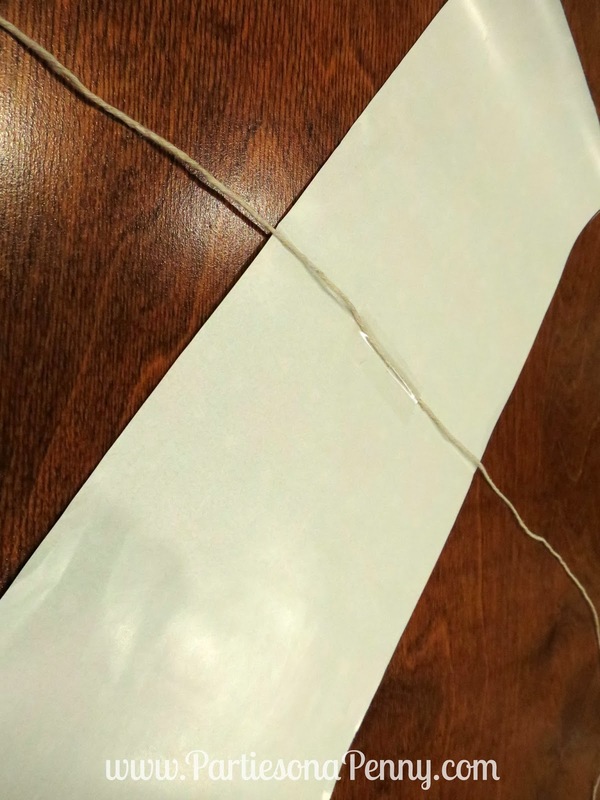 Lay out a piece of 6 foot long twine (you can also use yarn or string) on the fold and secure it with a piece of tape. 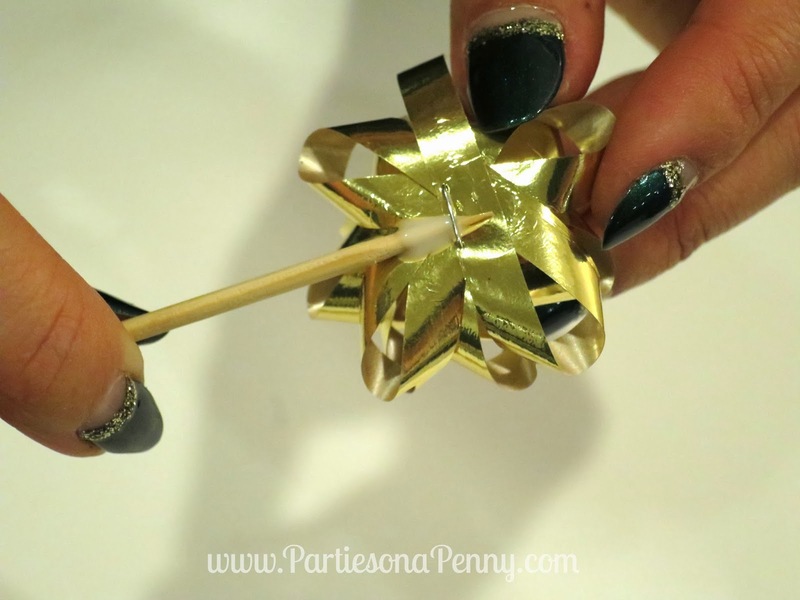 Fold over the pendant and secure it firmly to each other with double sided tape. 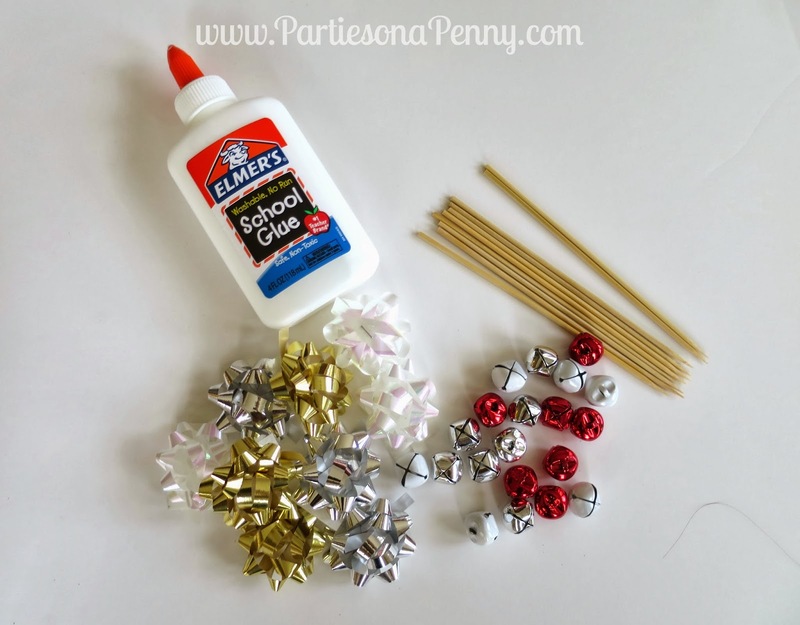 I would not suggest using glue as wrapping paper is very thin and can create unwanted bubbles. Space the pendants about an inch apart. You can either keep the pendants as is as rectangles or you can cut out the pendants into ribbons. 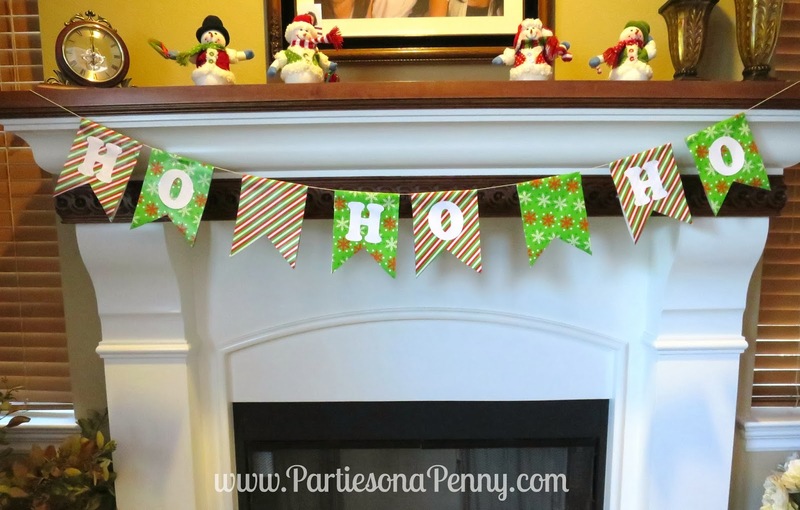 If you would like to add lettering to the banner, here is a link to a template to add HO HO HO cut outs CLICK HERE. The great thing about gift wrapping paper is the various patterns and colors it comes in. 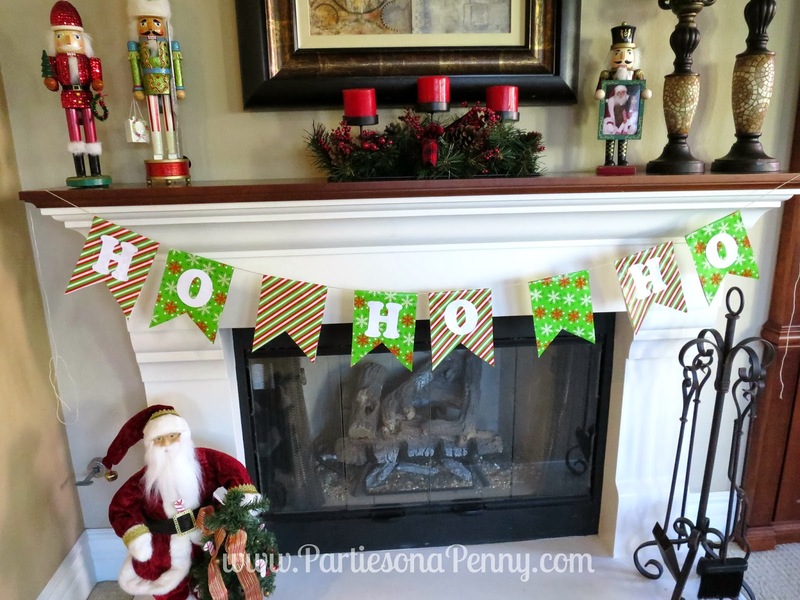 You can create various banners for any occasion: birthdays, Valentine's day, Halloween, etc. 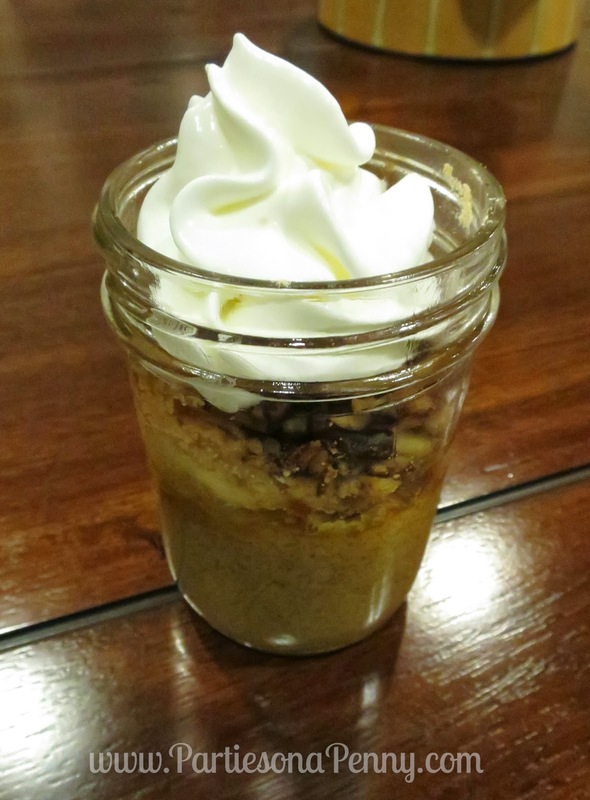 This Thanksgiving, give thanks to your friends and family with these deconstructed Pumpkin Pecan Pie in a Jar. 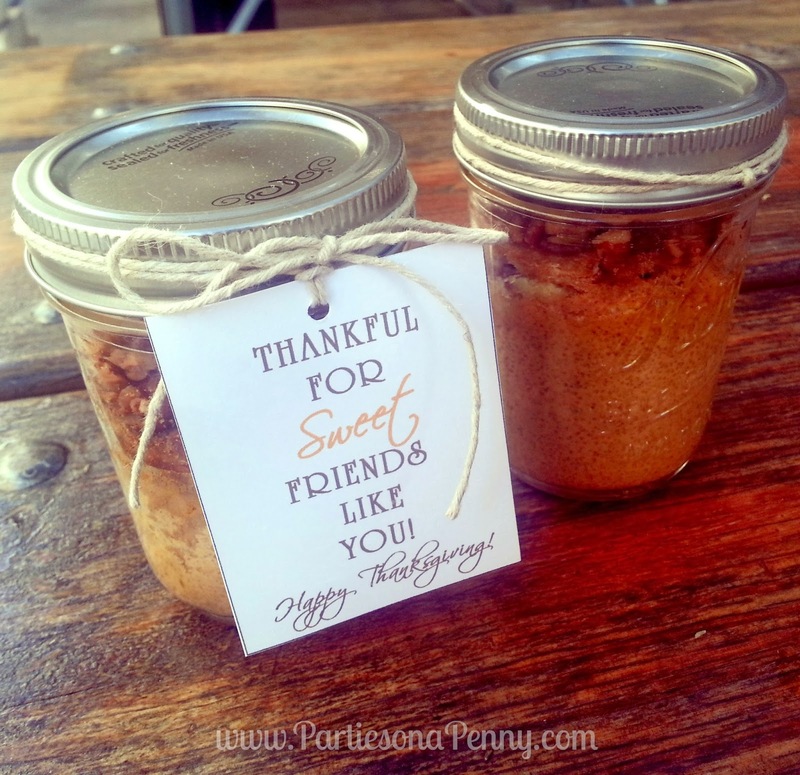 They are not only the perfect Fall dessert, but they make great favors/gifts for your Thanksgiving guests or hostesses. 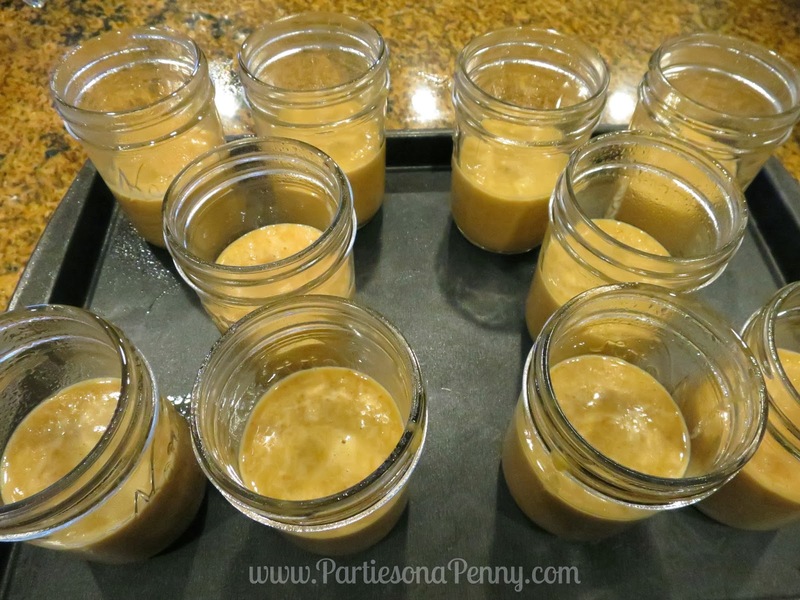 I was able to make 10 jars using this recipe with a cost of under $30 (including the price of the jars). The 1/2 pint mason jars I used were purchased from Walmart for under $8 for a dozen jars. Preheat oven to 350 degrees. 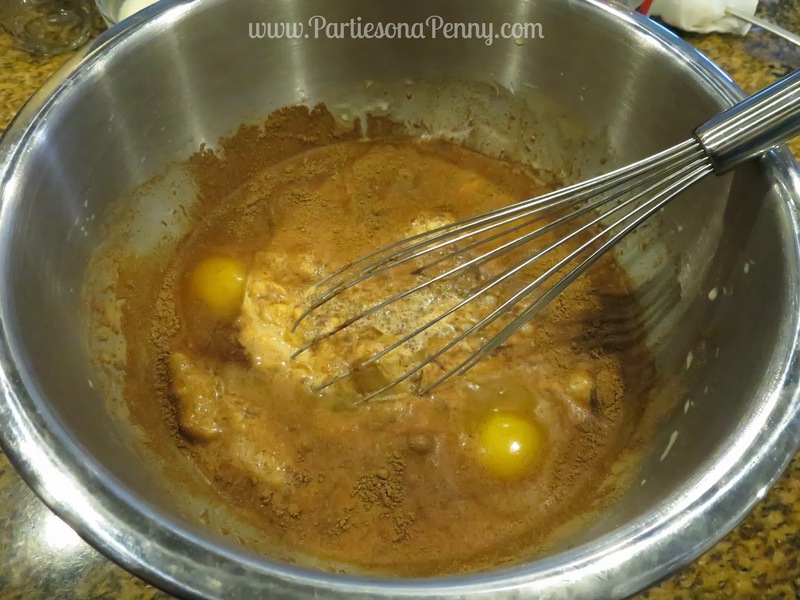 In a large bowl whisk together the pumpkin, milk, eggs, sugar and pumpkin pie spice. Place the mason jars on a baking sheet for easy transport in and out of the oven. Lightly spray the inside of the jars with non stick cooking spray or oil. 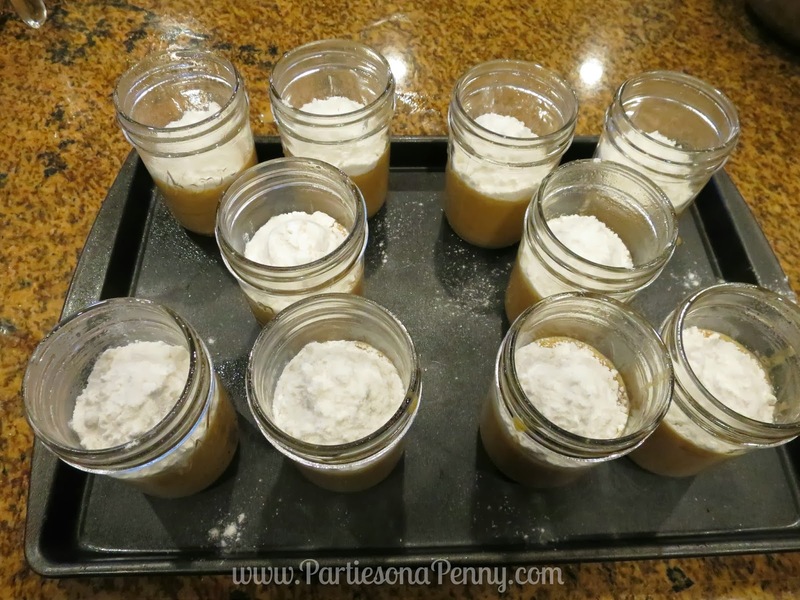 Using a large measuring cup, fill the jars no more than half way with the pumpkin mixture. 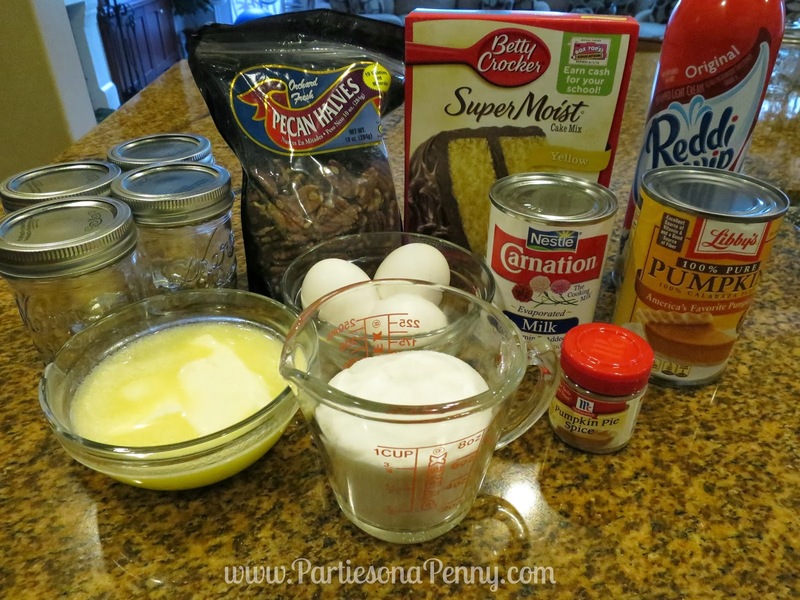 *When baking, this mixture does rise, so do not fill the jars more than half way so that it has space to close the lid as well as room for whipped cream or ice cream. Sprinkle two tablespoons of the dry cake mix on top of the pumpkin layer. Make sure to evenly disperse the cake mix so that it has an even layer on top of the pumpkin mixture. 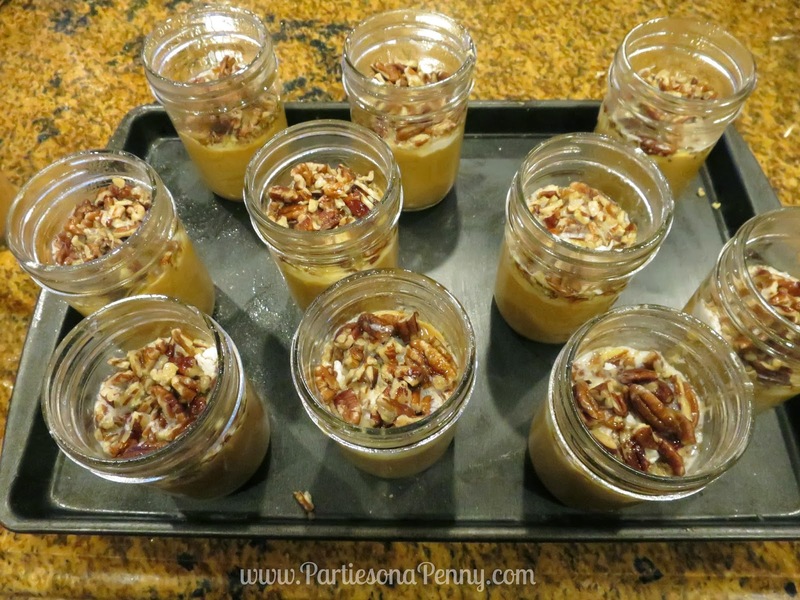 Then sprinkle a layer of the chopped pecans in each jar. Finally, pour 1 tablespoon of the melted butter on top of each jar. Bake for about 40 minutes and then let cool for at least 30 minutes. If you plan on giving these as gifts for Thanksgiving. CLICK HERE for a downloadable gift tag template. 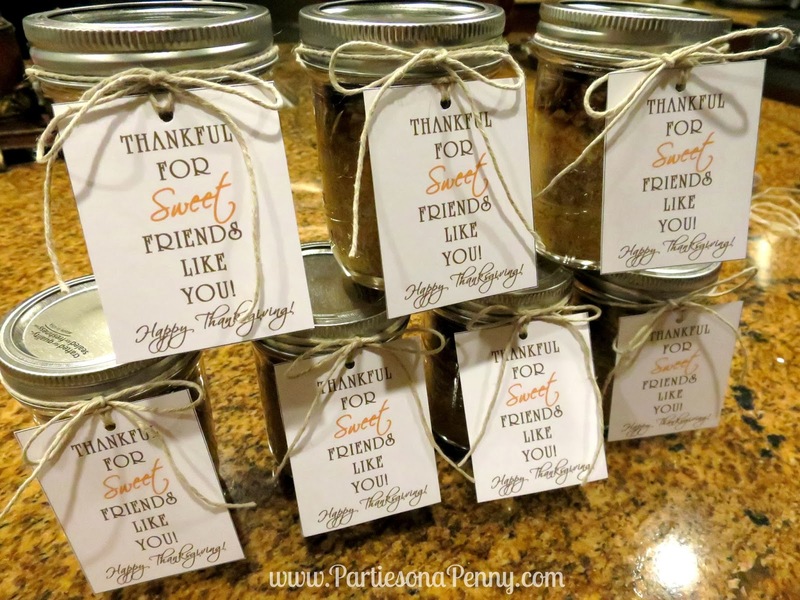 Use twine, ribbon, tape or glue to attach these tags to each jar. 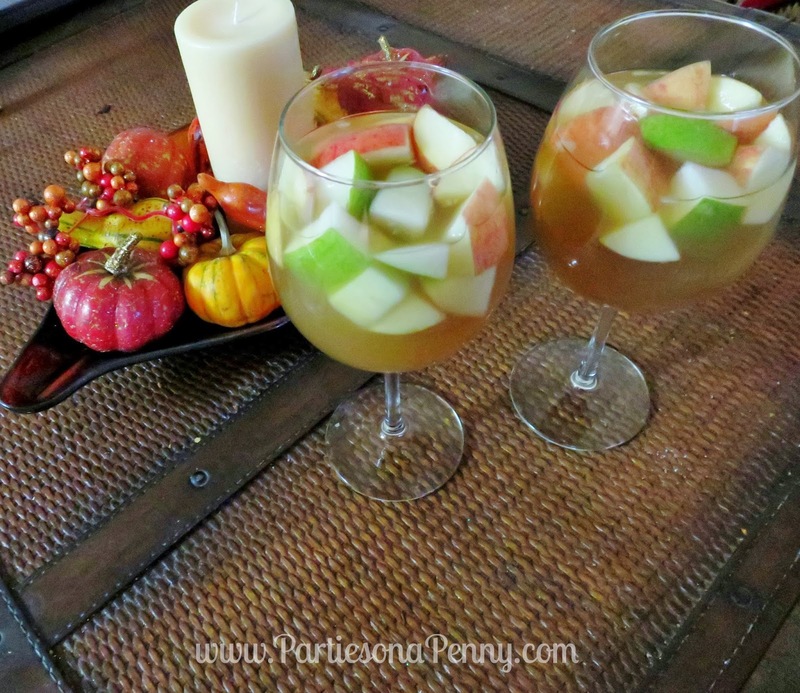 This cocktail is the perfect drink for any gathering during the fall as it is pretty much Autumn in a glass. 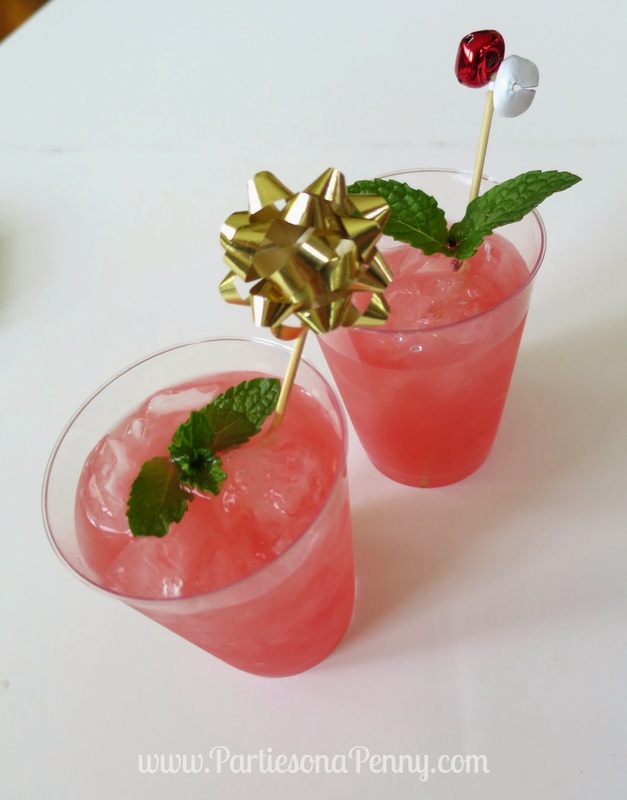 Serve it along with your Thanksgiving meal and it will for sure be a favorite drink among your guests. I purchased all the ingredients for this recipe at Trader Joes for a little under $22. This recipe serves at least 8 large glasses of sangria. 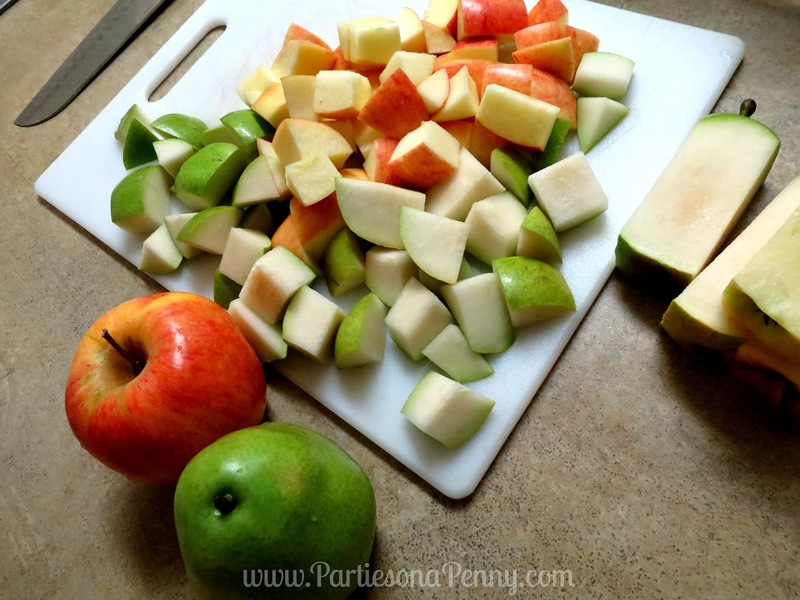 Combine all ingredients together in a large pitcher and stir. Refrigerate for at least an hour before serving. If the mixture is too sweet for your taste, add an additional cup(s) of brandy. 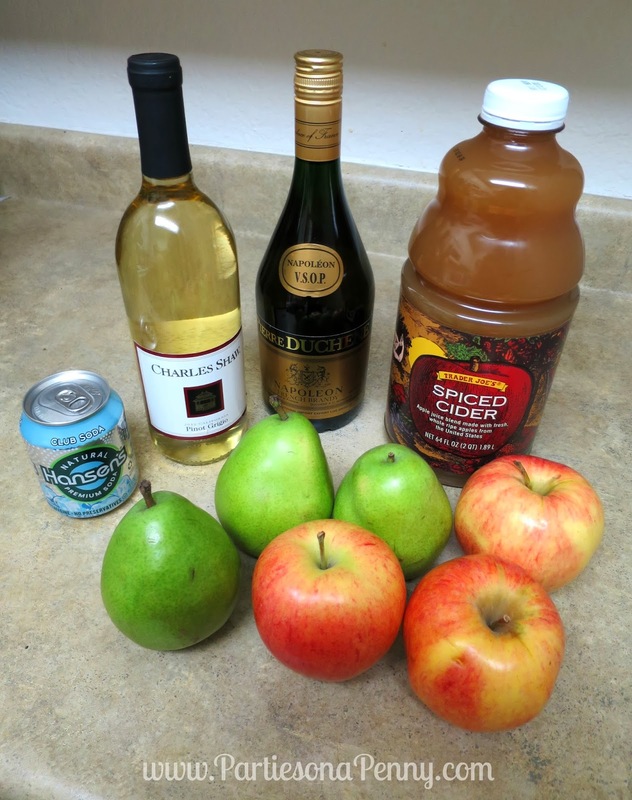 If the mixture is too strong in alcohol, add an additional cup(s) of cider. If the mixture is too concentrated for you, add an additional cup(s) of club soda. I made this recipe at my board game birthday party VIEW HERE. 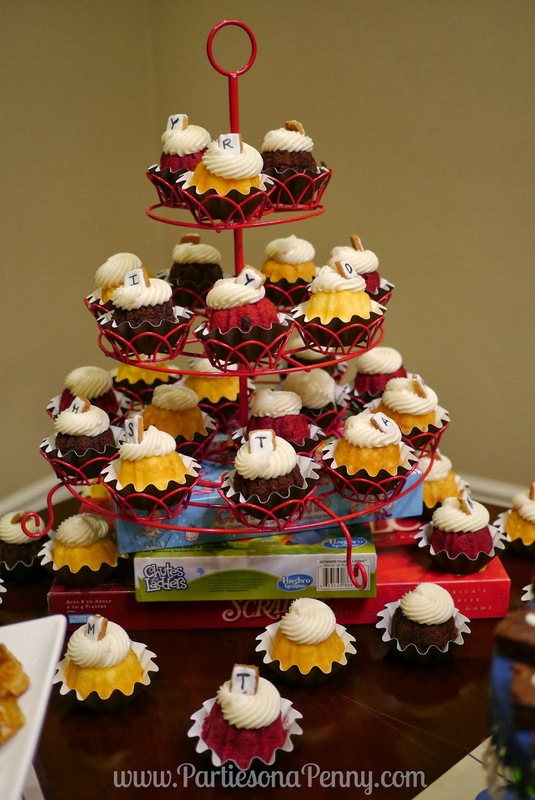 People were amazed that I made these from scratch. 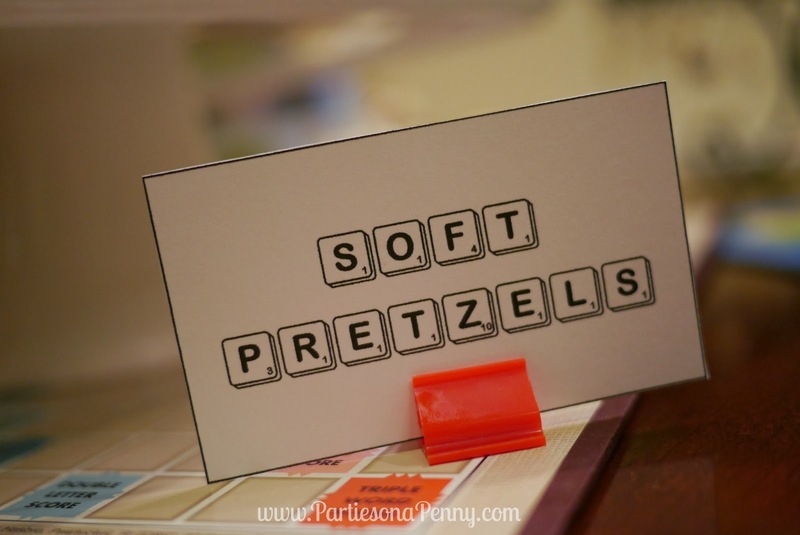 It was even more amazing to see their reactions when I let them know how easy this recipe is and how much cheaper it is making them from scratch than buying the frozen soft pretzels. 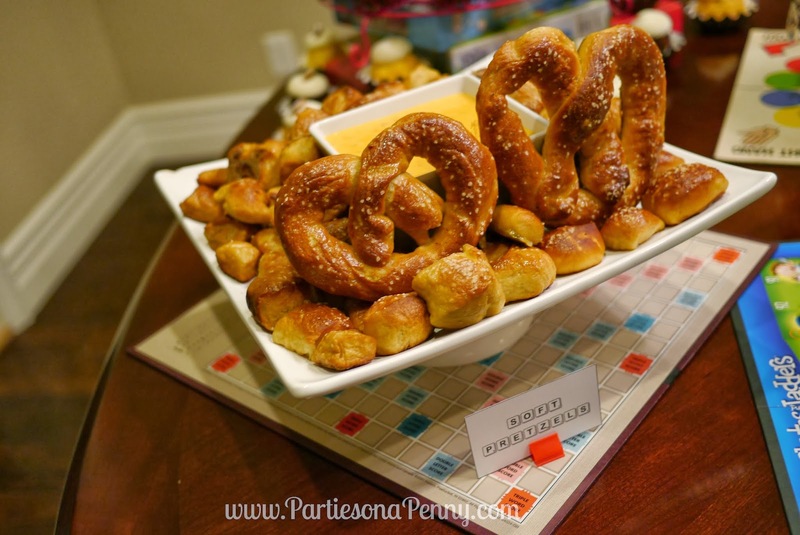 I served these pretzel bites along with several other dishes so it was enough to serve about 15-20 people. If you are serving these on their own, the serving size is about 6-8 servings. 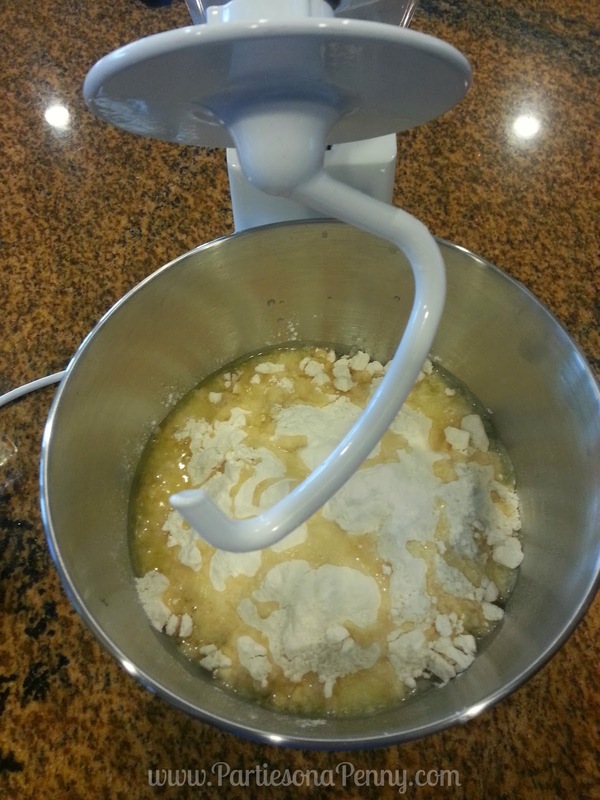 Combine the water, sugar and kosher salt in the bowl of a stand mixer and sprinkle the yeast on top. Allow to sit for 5 minutes or until the mixer begins to foam. 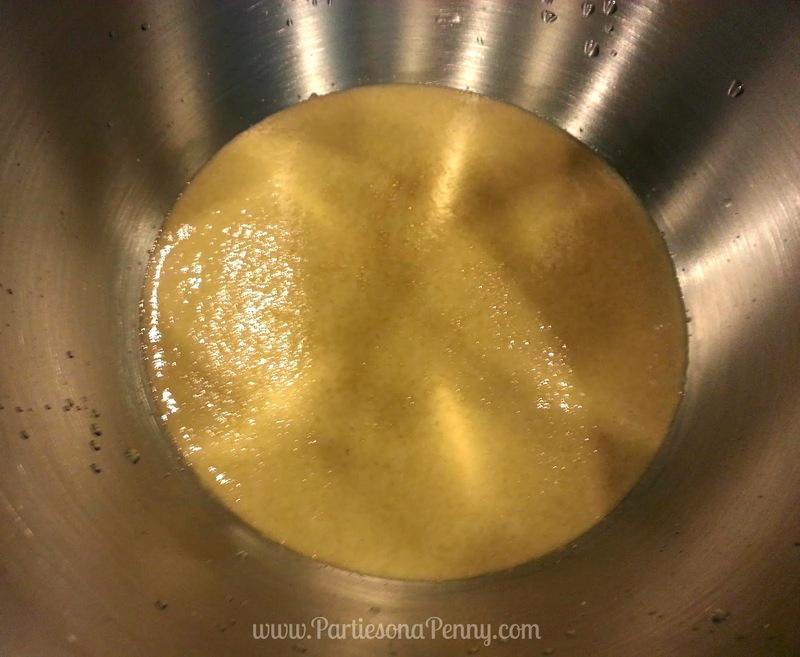 Remove the dough from the bowl, clean the bowl and then oil it well with vegetable oil or cooking spray. Return the dough to the bowl, cover with plastic wrap and sit in a warm place for approximately 1 hour or until the dough has doubled in size. Preheat the oven to 450 degrees F. Heavily coat the cooking spray on 2 baking sheets and set aside. Bring the 10 cups of water and the baking soda to a rolling boil in a large saucepan or roasting pan. In the meantime, turn the dough out onto a slightly oiled work surface and divide into 8 equal pieces. 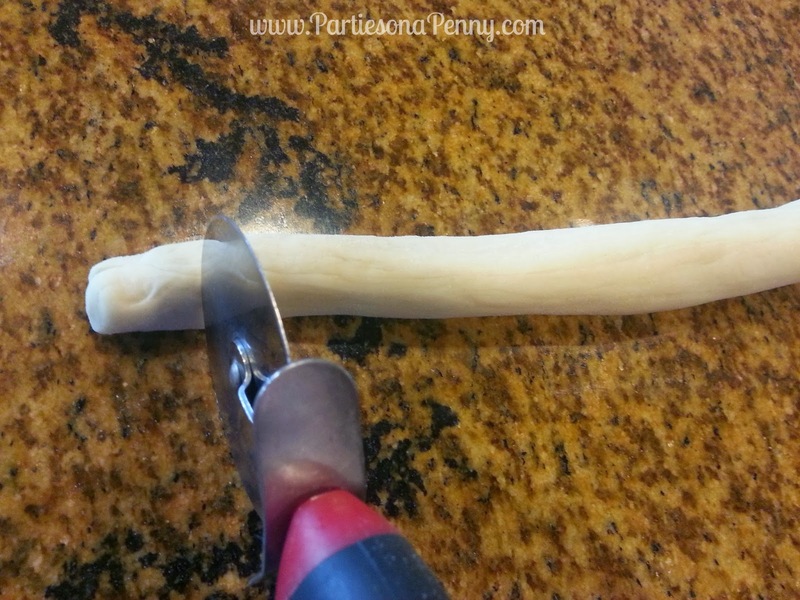 Roll out each piece of dough into a 1 inch round rope. Using a pizza cutter, cut 1 inch squares from each rope. 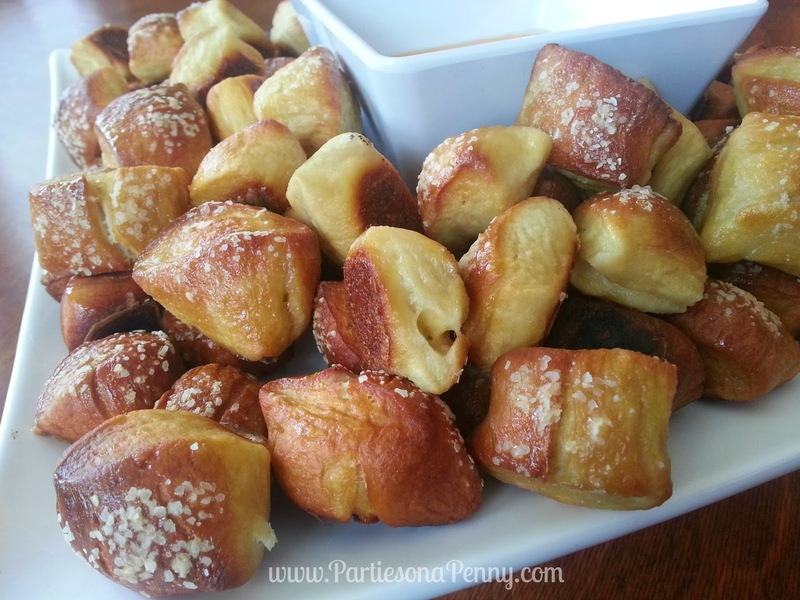 Place the pretzel bites (15-25 of them at a time) into the boiling water for 30 seconds. 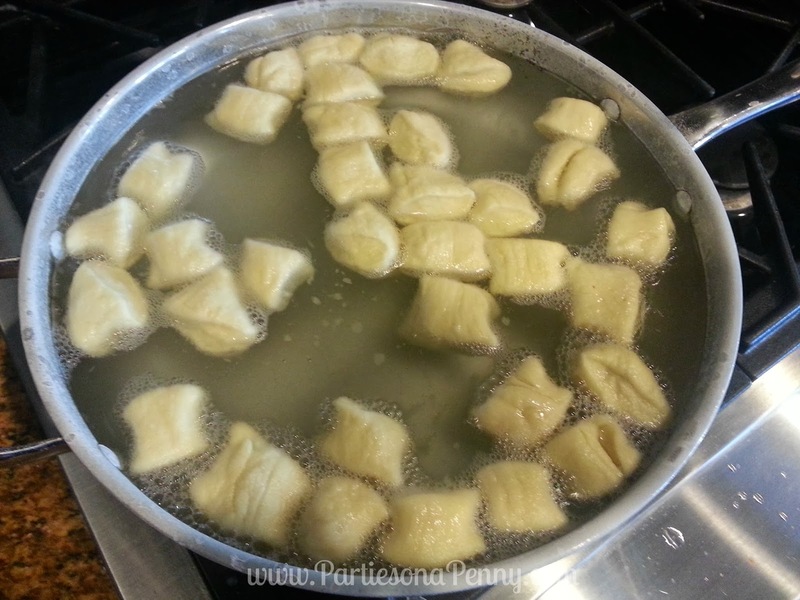 Remove them from the water using a large slotted spoon. Return to the baking pan, brush the top of each pretzel with the beaten egg yolk and water mixture and sprinkle with Kosher salt or pretzel salt. Bake until dark golden brown in color, approximately 10 to 12 minutes. Transfer to a cooling rack for at least 5 minutes before serving. Serve with mustard or warm nacho cheese dip. 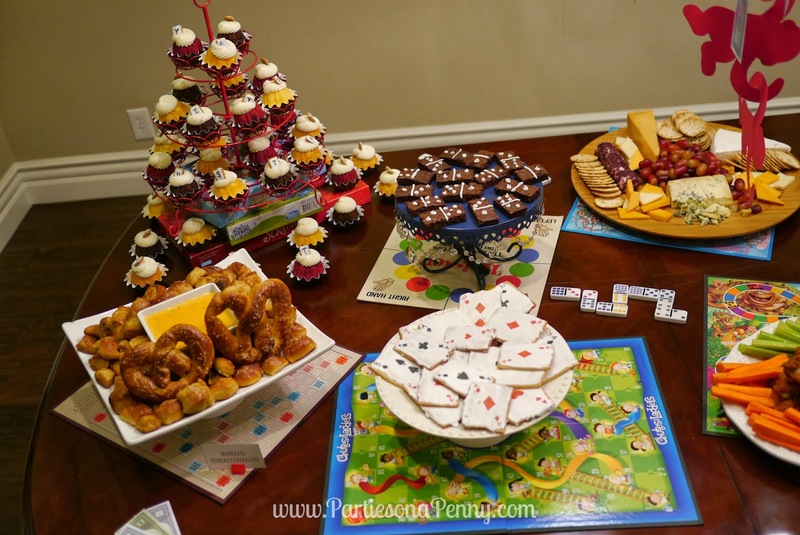 Being a competitive person, I knew that for my last birthday in my 20s, I wanted to have a board game night with my friends. Our house has almost every board game known to man, so it was easy to get inspiration and I was able to use the board games for decorations, so I didn't have to spend anything on decor. 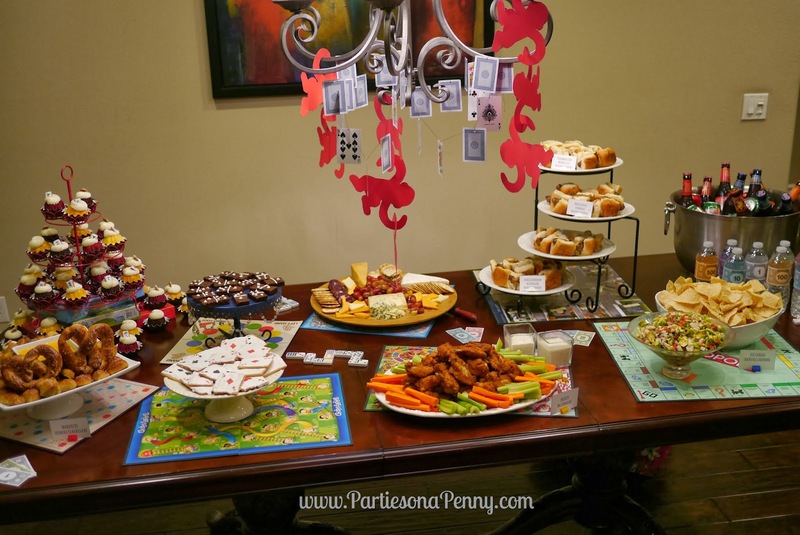 Here is a breakdown of all the elements that brought together this tablescape for around $150. 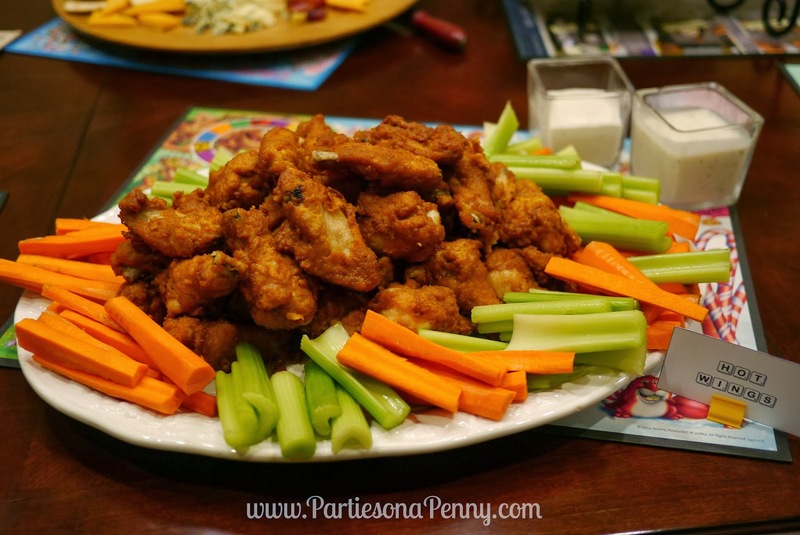 I was originally going to make these from scratch, but realized that it was going to be an extreme undertaking to make hot wings for 20 people with everything else on the menu. Coming to my senses, I decided to purchase these cooked from the local grocery store for $25 for 5 lbs. Although I could have easily purchased these frozen at the grocery store, I decided to make them from scratch to cut the cost down immensely. The recipe was somewhat time consuming but it was pretty simple to follow. 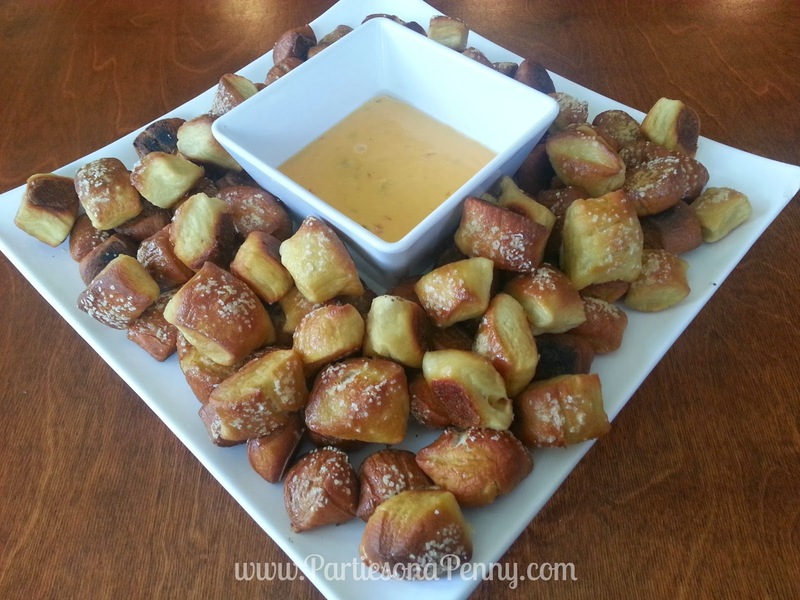 I served these pretzel bites with warm nacho cheese. 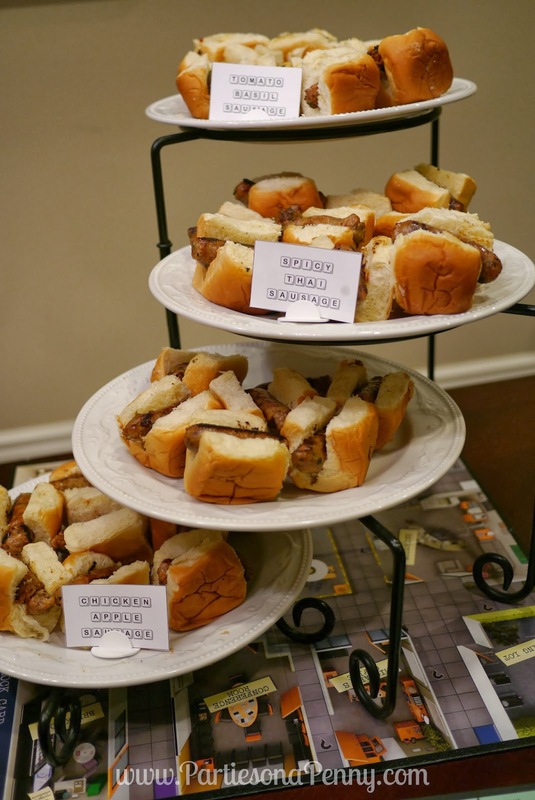 To assemble these mini hot dogs, I purchased link sausages (Spicy Thai, Tomato Basil and Chicken Apple) from Whole Foods and steamed Hawaiian Rolls for the buns. I divided and cut each individual sausage link in half prior to cooking them to make for the perfect sausage size for these mini hot dogs. 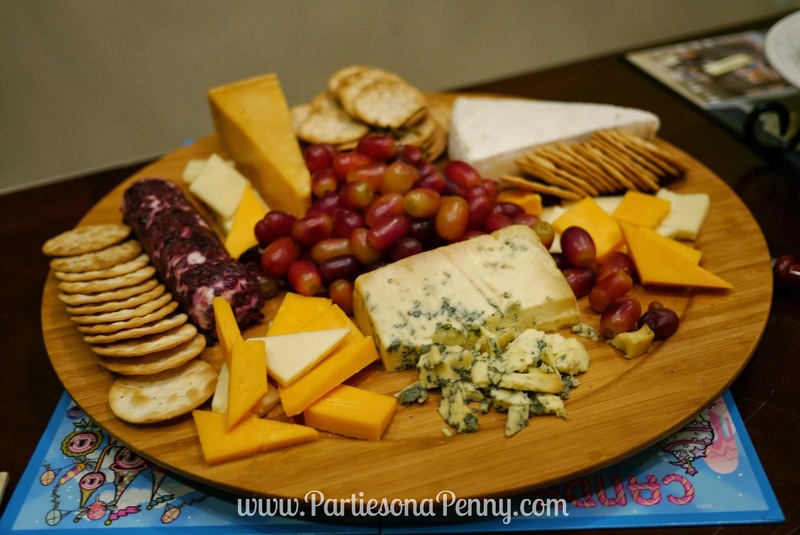 At almost every party I host, I always have a cheese plate available because I LOVE CHEESE! I gathered this display of cheeses (Goat cheese, Blue cheese, Brie, Aged Gouda and some Cheddar and Jack cheese) from Trader Joes. I discovered this Fish Ceviche at a local Bodega and I knew I wanted to serve it at my party and was not even going to try and replicate it. 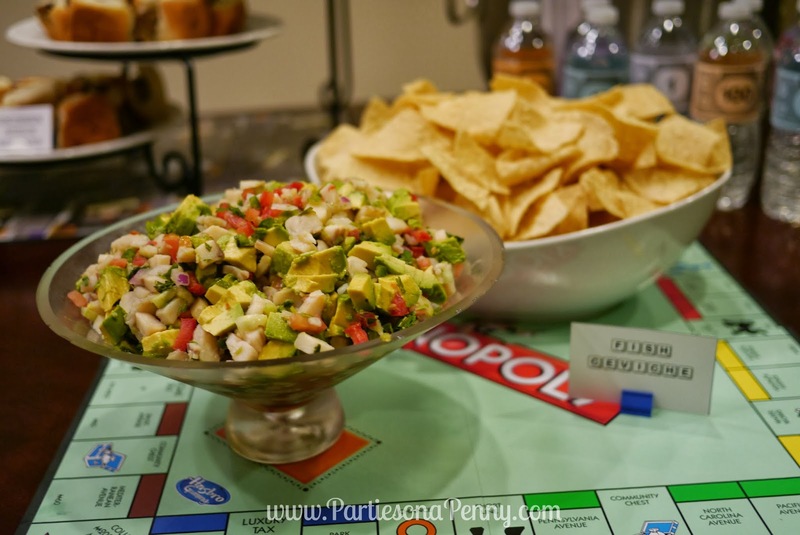 This dish was a huge hit a the party and was even great served with fresh tortilla chips, also from the Bodega. I customized these sugar cookies by cutting them out into rectangles using a sugar cookie mix. Once the cookies were cooled, I used vanilla cookie icing to coat the cookies. After the icing hardened, I used edible markers (found at Michaels for $5) and drew on the card suits. Every year I get my birthday cake from Nothing Bundt Cake, but this time I decided to get mini bundt cakes. 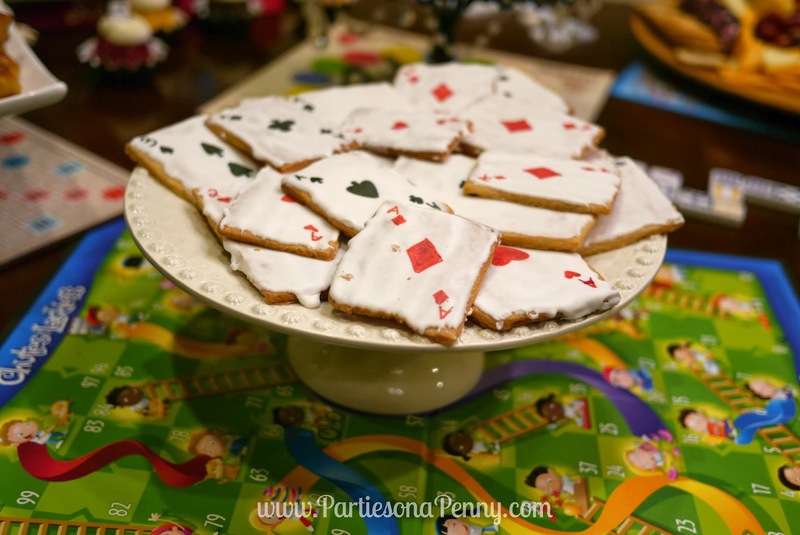 To go along with the board game theme, I added Scrabble pieces that I made out of sugar cookies just as I did for the sugar cookie playing cards. 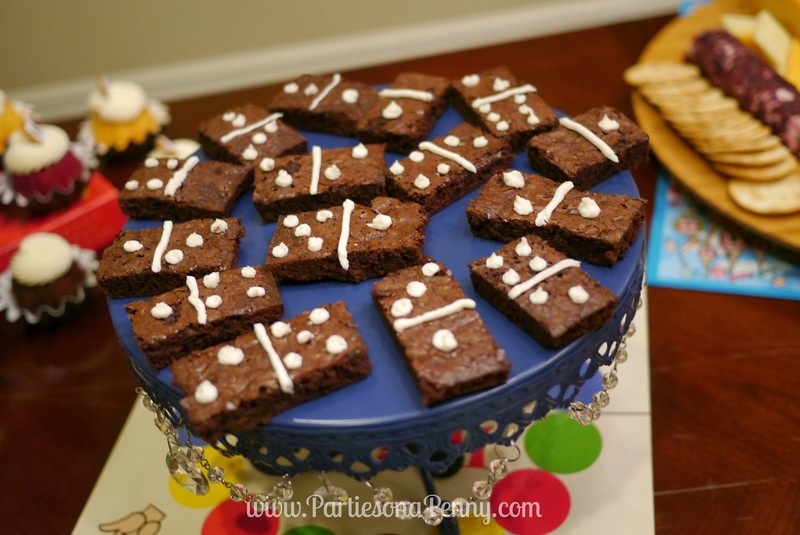 These domino brownies were so simple to put together. The brownies were made from a box mix and once they cooled, I cut them in the narrow rectangles, then piped the dominoes patterns on the brownies using the same icing from the sugar cookies. 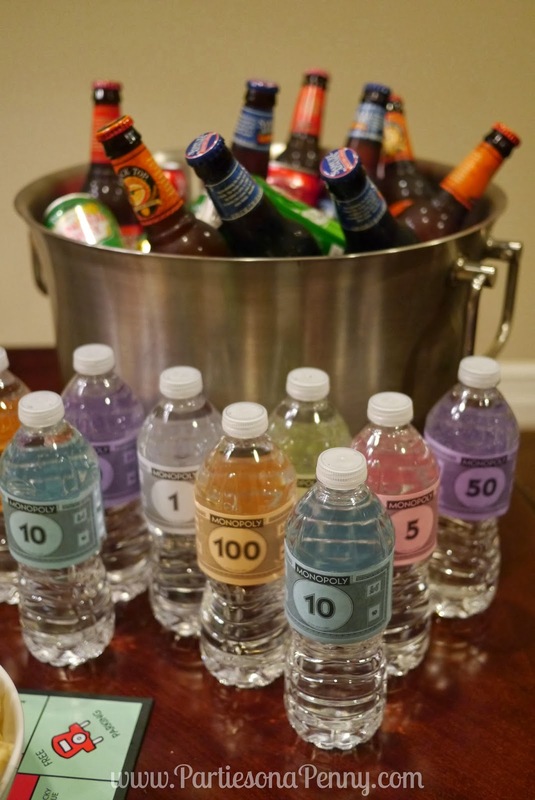 In addition to beer and soft drinks, I also provided water bottles wrapping them in Monopoly money from the board game box to go along with the theme. For the food tags, I luckily found this Scrabble font on Fontgirl.com (font name Scramble) and printed them out on card stock and used game pieces as holders. 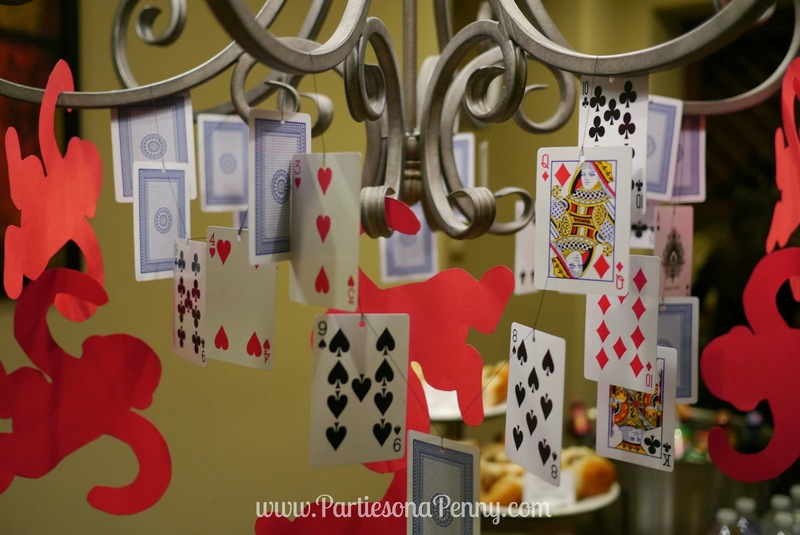 I dressed up our chandelier stringing playing cards and cutting out life size red Barrel of Monkeys (found the silhouette on Google images). 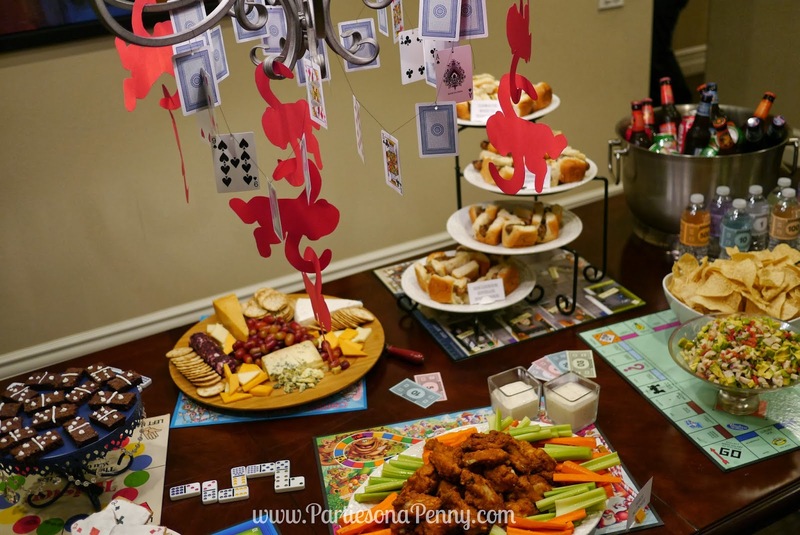 To decorate the table and tie in the board game theme, I used game boards as a place mat for each dish. I filled up the empty space on the table by fanning out Monopoly money and domino pieces.